LES VOYAGEURS CANADIENS ... S'IL VOUS PLAÎT TROUVEZ LA PROPRIÉTÉ N ° 407888 ON HOMEWAY. CA (PAS LE SITE US HOMEAWAY. COM) POUR NOUS POUVONS TRAITER VOTRE RÉSERVATION EN $ CANADIAN. Le Village House est une charmante maison de caractère entièrement reconstruite dans l'un des plus beaux villages de bord de mer de la Nouvelle-Écosse, avec vue sur l'océan au-dessus de King's Pond. Nous sommes à cinq minutes à pied de Kingsburg Beach et à 10 minutes en voiture de la belle plage de Hirtles. La ville historique de Lunenburg est à 15 minutes en voiture. La maison a été entièrement rénovée avec 3 chambres ... dont 2 avec lits King et salle de bain attenante. La chambre principale dispose d'un jacuzzi et d'une cheminée à gaz. La troisième chambre à l'étage principal a des lits jumeaux confortables et une troisième salle de bain avec douche. La cuisine est bien équipée. La grande terrasse autour du pont a de belles chaises Adirondack pour se détendre avec votre café du matin, table à manger et barbecue Weber pour manger al fresco. Il y a une laveuse / sécheuse HE au sous-sol. Internet sans fil est également disponible. Mots-clés: 3 chambres, 3 salles de bains, enrouler autour de terrasse avec vue sur l'océan. Marchez jusqu'à la plage. The house once again amazed us. The house is always kept super clean and well stocked. Having three full bathrooms makes it work so well for our family of five. The views from the house and the access to wonderful beaches and local sites of interest cannot be compared. Debora is very responsive and helpful whenever we had questions. Highest recommendation!!! We can’t wait to return in the summer. Leif, come back again! We loved sharing the Village House with you and your lovely family even in December! This cozy and charming home was perfect for us. The kitchen was so well equipped with everything we would ever need, and the beds (and bedding) were extremely comfortable. Since the weather was rather chilly, the fireplace in the TV room was a wonderful amenity. The deck and comfortable chairs were perfect for relaxing while watching the pond, ocean, and deer in the yard. Debora was very accommodating; we had “several” questions during our stay and she was very quick to respond and make suggestions about where to eat and what to see. This was an outstanding experience for us, and I would highly recommend the Village House. Our only regret is that we live so far away! It was our pleasure! Thank you for being such responsible guests. Come back soon. This house is an incredible treasure! Secluded, picturesque, and totally peaceful. The kitchen is well appointed and the bedrooms comfortable and relaxing. The den with the fireplace was a perfect place to relax after a day of sightseeing. We were very pleased with this rental and highly recommend it to anyone looking for a cozy and accomodating place to stay. The owners were pleasant and helpful with good communication and suggestions for our stay. Thank you for a wonderful stay! Susan, thank you so much. We are happy to hear that you loved the Village House and Kingsburg as much as we do! Come back and see us again. Perfect home for a group . It was a lovely home perfect for three couples visiting the area. The view and surrounding was beautiful. 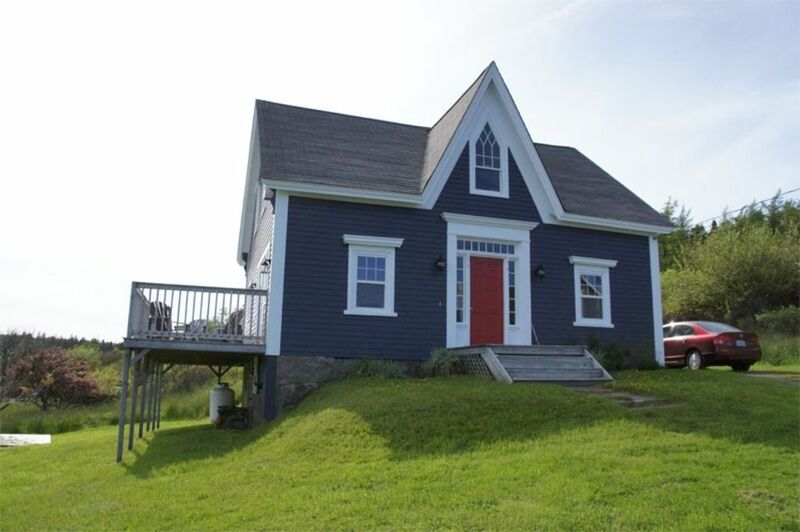 Lovely cottage near Lunenbyrg, Nova Scotia. Thanks Deborah for your lovely cottage. We enjoyed our stay, the three beaches really close by, the house, the deck, and the scenery. Thanks for your attention as well, and your great advice on taking the bridge to PEI rather than the ferry! We loved every day that we were there. We had a wonderful stay in Kingsburg with our two young (5 and 7) children. Debora and Moya's house is beautiful, clean and very comfortable with everything you could possibly need for a week away. It is perfectly located next to Kingsburg beach with Little Hirtles beach a 10-15 minute walk away. We loved our vacation here and wouldn't hesitate to book again. Thank you Debora and Moya! Thank you Marah for being the perfect guests! Come back and see us again!